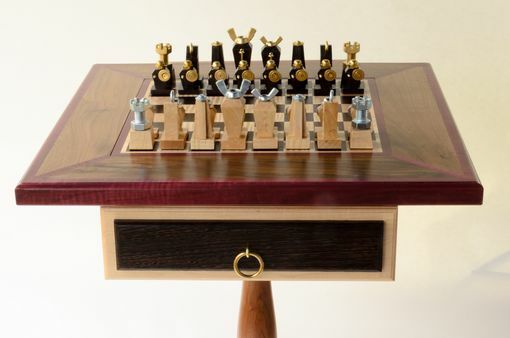 This "one-of-a-kind" Chess Set & Table was made for a very special friend & woodworking colleague. Knowing this particular person to be very skillful with all forms of technology, both with his hands & intellect, an idea formed for the shape of the individual chess pieces. 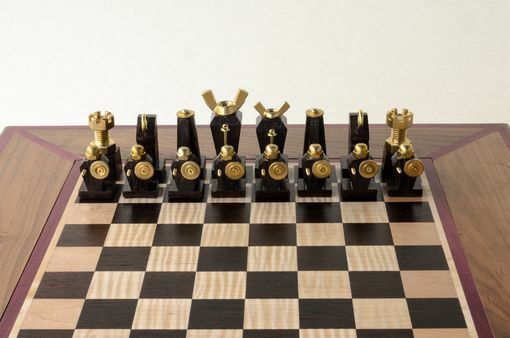 Each chess piece is made from a different type of hardware & matched with either curly maple or with wenge; 1 complete chess set is made of brass and the other with shiny chrome. A close examination of the chess pieces reveals how each piece is constructed. The wood to make the Chess Table was actually given to the craftsman by the customer; it was returned to the customer in the form that is shown in the attached photographs. The checkerboard pattern is made from curly maple squares and wenge squares; it is banded with purpleheart and mitered with the same purpleheart. The basic cabinet parts, drawer parts, and central turned post with 3 matching curved legs are made from dark walnut. 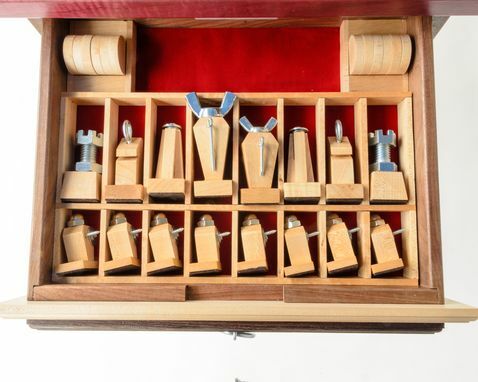 An additional tribute to the customer's technological skill is the "O" handle rings used on the drawer fronts. Each drawer is sub-divided to store each chess piece & the bottom is covered in dark red velvet. The walnut base was covered with several coats of dark walnut Danish oil, while the top received several clear coats of lacquer. As was said previously, this is a "one-of-a-kind" Chess Set & Table; because of it's uniqueness, it took a little over 2 years to complete. 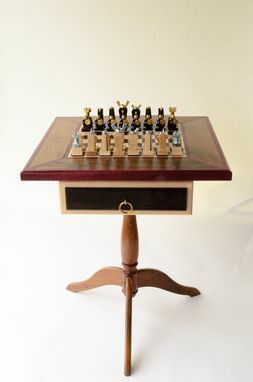 Please contact the craftsman through the CustomMade.com website to ascertain how long it might take to make other "one-of-a-kind" Chess Sets & Tables.